Although surfing is wildy popular in many parts of the world, the surf culture was a phenomenon that developed in southern California after World War ll and spread quickly during the 1950s and 1960s. Centuries ago, the sport was popular with Hawaiian nobility who practiced the ancient Hawaiian tradition of "he'e nalu", meaning "wave-sliding". In southern California there are over 35 excellent surfing beaches, Huntington Beach (also known as Surf City), Malibu, and Hermosa Beach to name a few. In the hunt for great waves, surfers often become dedicated to their sport in a way that makes a more traditional life impossible. Surfing instead becomes their lifestyle. The evolving California surf culture affected fashion, films, jargon (hang ten: to ride a surf board with all ten toes curled over the front edge; woodie: a station wagon with wood exterior paneling; bikini: you know what that is; baggies: loose, wide-legged shorts or swim trunks), and music, where the Beach Boys, among others, made the surf sound a national sensation. The shaka sign, associated with Hawaii, is a common greeting in surfer culture. When I go to Hawaii, I regularly see people exchange the shaka greeting and I think it's cool. It's a constant reminder that in Hawaii, it is not typical to worry or rush. The shaka sign represents the philosophy of “island style.” It signals that everything is all right. Surfing devotees follow waves all over the world but southern California will always be associated with the surf culture here in the USA. 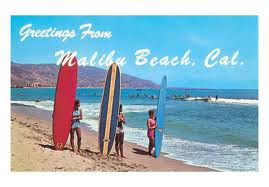 Go there, rent a surf board, and hang ten!